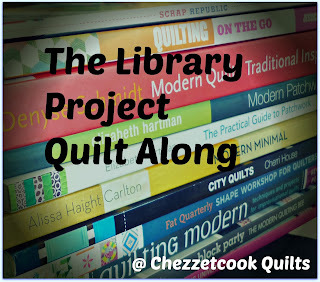 Adrienne over at Chezzetcook Modern Quilts is launching a fun year long project of working through books from our Modern Quilting Libraries (and was kind enough to make the rules flexible enough to accommodate magazines and patterns too). I hope this is the first year of many because as I was flipping through books, I was seeing many other projects to make. Nothing new is on this list if you read my quilting goals for the year part 1 and part 2, but those lists included some online quilt alongs too. I’m taking today to pull out the book and pattern projects, so I can officially link up to The Library Project. Though on the cover Scrappy Quilts doesn’t look modern, there is a mix of styles in the book from traditional to modern. I plan to make the Main Event pattern shown below. It’s going to be my first experiment with flannels since I already have some fabric with fun little turtles on it. Here are the next two quilts that I’m planning on making – –In Your Neighborhood, which I scooped up when Melissa at Happy Quilting released the pattern a few months ago and Colorblock by Holly at Bijou Lovely, a pattern that gets lots and lots of credit for making me want to get back into quilting. I saw a version of it on Pinterest and realized if I started quilting again, it wouldn’t be the type of designs that I played with in high school. I liked that thought. I’m supposed to be cutting all the sashing for Gimme Diamonds this month to meet my Lovely Year of Finishes January goal. Push me, Pull me is a pattern that I won from Michelle at Squeek Crafts when she launched it this year. Can you tell that I’m a sucker for pattern launches? I already have about half of the arrows cut because while I was making bee blocks, I decided I wanted to base the quilt on the colors one of my bee mates requested. And, finally, I’ll be making what will hopefully be many, many projects in Vintage Quilt Revival . This book actually has made me lose sleep. I’m not kidding. Can’t you tell how much I love it by all the post-it notes sticking out of it? One night I started going through to decide how I might want to adapt some projects to make it manageable to keep up with the Vintage Quilt Revival Block Along starting this week. I told myself that I’d just look at a few quilts and think about them, and then many, many quilts later I was still awake with my mind spinning color combinations through it. Since we’re supposed to pick just one project for The Library Project, I’m going to make the Geometric Slide quilt since I’ve already gathered the fabrics that I need for it. I can’t wait for our monthly check in link parties to start. The other Library Project participants have some amazing projects selected. And, it’s not too late to join in. The goal setting link-up closes in just under 3 days, so come join us! This entry was posted in quilting and tagged quilt, the library project. Bookmark the permalink. Looks like you are going to be one busy quilter!!! Hope you have a wonderful time with all those ideas! Sounds like fun! Love the Colorblock quilt. Looking forward to seeing your progress. Great choices!! I, too love that color block pattern!